Fairmont Triathlon (2018) - AllSportCentral.com - Registration. Results. Relax. Mini (kids), Sprint and Olympic Triathlon distance events also Duathlon course and a 5K Run, ALL in the City of Five Lakes (Fairmont, MN). Proceeds go to Martin County Area Kinship. Registrations received by May 20, 2018 will be guaranteed a t-shirt by size requested. Registrations received from May 21 to June 1 will be guaranteed a t-shirt. After June 1, t-shirts will be on a first received basis. 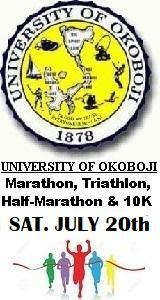 Race Day registration fees are increased by $20.00. Register early & save big! 25 meter (or less) swim, 3.1 mile (5k) bike (along Olympic and Sprint run course), 1k (.6 mile) run through park ending at finish line. Ribbons and t-shirts to all participants. Tentative Duathlon Distances: 2 mile run; 20k bike (12.5 miles) on flat county roads; 5k (3.1 miles) run through residential area. A new event this year! 5K runners give this a look.